by Eric from Tupelo, Miss. Deuteronomy 15:11 “Therefore I command you, “You shall open wide your hand to your brother, to the needy, and to the poor…. Growing up my parents instilled in me a responsibility to serve others, and in college God placed within me a heart for missions. Over the years, however, I allowed “life” and my pursuit of the “American Dream” to crowd out that desire. 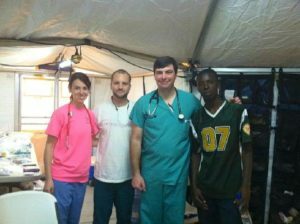 When a friend contacted me about joining a medical team to Haiti last February, God reminded me of His command to serve. Our team had the opportunity to provide medical care to a remote fishing village in Haiti. These people were literally hours, if not days, from any outside resources or medical care. It was difficult to grasp how these villagers were surrounded by water, yet did not have a source for clean drinking water. Although the medical care we were able to provide was minimal, the gratitude they expressed was immeasurable! It reminded me of how much a simple touch or smile can impact someone in need. God can take something simple in man’s eyes and use it to accomplish something great for his Kingdom! This is something I carried home with me and try to be mindful of on a daily basis. Since we were there in Recif, HMM dug a well so the people in these remote villages can have access to clean drinking water. I praise the Lord for the work of HMM as they meet both the spiritual and physical needs of the people of Haiti and the Dominican Republic. I fell in love with these beautiful people and can’t wait to go back and serve again!